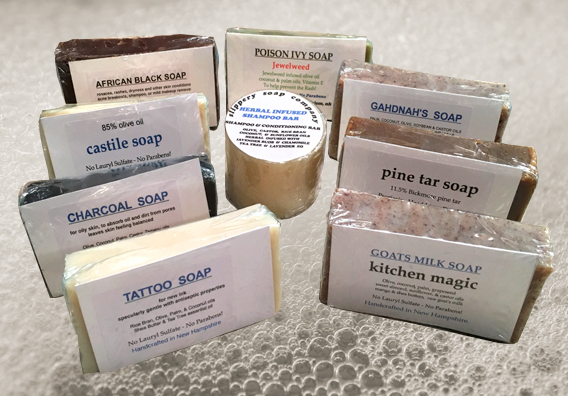 Our New Hampshire made, premium Specialty Soap Bars are formulated with you in mind! 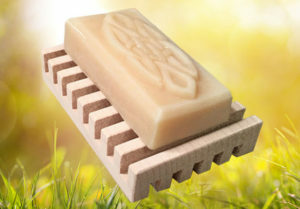 Whether you have a fresh tattoo or tough-to-wash gardener's hands and knees, or maybe poison ivy, acne or maybe you're just plain grubby - there's a Slippery Soap for you! From tried and true old timers to the latest discoveries, these serve a special purpose for you! AFRICAN BLACK - dry skin and acne - medicinal chocolate. CASTILE - classic Spanish olive oil soap - unscented. CHARCOAL SOAP - oily skin - absorbs and draws out the oils - tea tree. GAHDNAH’S SOAP - has the grit to remove the dirt - rosemary. HERBAL INFUSED SHAMPOO BAR - rub it through your wet hair then create incredible lather - lavender & tea tree. KITCHEN MAGIC - take the smell away - fish, onions, garlic - hands, cutting boards - anise. PINE TAR SOAP - the classic for head lice, dandruff, psoriasis, fleas on pets - 18.5% Bickford pine tar. POISON IVY SOAP - think you made contact? Jewelweed will counteract those poisonous oils - unscented. PREMIUM SHAVING SOAP - revitalize your face with its tingling effect - bay rum. TATTOO SOAP - keep it clean. for tattoo aftercare with antiseptic - tea tree.